The Bishop McDevitt Crusaders may be having a down year by their standards, but Shippensburg knows that is no excuse to take them lightly. "They are very athletic and big, especially up front," Shippensburg coach Eric Foust said. The Crusaders (7-4) will visit Veterans Memorial Stadium to face the Greyhounds (10-1) in the District 3 Class 4A semifinal, at 7 p.m. on Friday. This season, McDevitt has more losses than any season in the last ten years, but has won seven of their last eight contests, scoring more than 40 points in four of those wins. At the center of its offense is running back Matt Geiger, who is averaging 6.7 yards per game and has scored 11 touchdowns this season. "Their offensive line is really good and their running back runs hard," Foust said. "He reminds me of (Brady) Beckner from Waynesboro." Shippensburg will have to shore up its defense especially after giving up 274 rushing yards to Northern York. It was a "bend but don't break" effort for the Greyhounds as they allowed the Polar Bears to go up and down the field, but were able to recover several fumbles in the red zone that prevented Northern York from scoring. "We definitely could have put more effort into last week and that's why we have been doing drills to work on constant hustle," Shippensburg linebacker Ian King said. The Greyhounds will look to build on last week, trying to couple their red zone defense with a better effort on the rest of the field. "Defensively I thought a lot of things were positive but we need to be better," Foust said. One advantage for the Greyhounds is that the Crusaders will be without their starting quarterback Tayvon Bowers, a Wake Forrest commit who has been pegged as one of the top quarterbacks in the state. 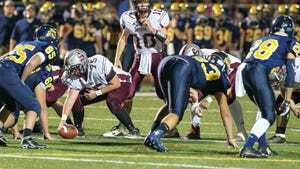 Bowers injured his knee against Lower Dauphin and is out for the season. In relief for Bowers is sophomore Chase Diehl, who is 1-1 as a starter this season. He threw for 215 yards last week in McDevitt's first round win over Milton Hershey. Offensively Foust said Shippensburg will look to control the time of possession and keep McDevitt's high powered offense off the field. Last week Northern York put together several long drives, forcing the Shippensburg offense to watch from the sideline. When the Greyhounds were on the field, they struggled at times to move the ball, particularly with their passing game that has been reliable all season. "They played a two-high safety which made it difficult to pass the ball down the field. We weren't as efficient as I would like to be," Foust said. "So we decided the best way to attack was to run the ball." However, running the ball does not put the Greyhounds at a disadvantage. Last week Bishop McDevitt gave up 315 yards rushing to Milton Hershey, something the Greyhounds will look to exploit this week with Adam Houser's power on the ground. This year Houser has 1,110 rushing yards with 10 touchdowns, and has turned it on in the second half of the season. "We do want to throw the ball more, but we'll be OK running it. We just have to take the game as it is," Foust said. Game data: Bishop McDevitt Crusaders at Shippensburg Greyhounds ... Friday, 7 p.m. at Veterans Memorial Stadium ... District 3 Class 4A semifinal. Teams: Shippensburg (9-1) is the No. 2 seed, while Bishop McDevitt (7-4) is the No. 3 seed. The Greyhounds have won 23 straight at Memorial Park while the Crusaders have a 25 game district tournament win streak.